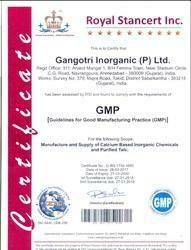 Gangotri Inorganic (P) Ltd., an ISO 9001:2015, FSSAI & GMP certified company, was incepted in the year 1997, as a fine Manufacturer, Supplier and Exporter of a commendable range of Inorganic Chemicals. The offered range made up of quality products like Calcium Carbonate Precipitated IP BP USP EP JP, Calcium Carbonate Activated (Coated), Calcium Oxide USP JP, Calcium Hydroxide BP USP EP JP, Purified Talc IP BP USP and many more, is highly acclaimed and asked for in the market. Manufacturing of these products is done in compliance with the industry set norms and guidelines, utilizing the finest ingredients and modern machines. Owing to this, the offered range has an impeccable effectiveness and a longer shelf life. Further the offered range is priced reasonably, for maximum client satisfaction. We are widely acclaimed for our ultra-modernistic and state-of-the-art infrastructural facility, which is laced with all the necessary machines and equipment. This helps us in the attainment of several of the firm’s objectives and goals. For the purpose of maintaining and boosting our market share, we keep upgrading our facility on a regular basis. Dividing of the facility into several units is done in order to attain finer and smoother management of the firm’s operations. These units are further, lead by skilled professionals, who direct all of their energy and efforts to maximize our production capacity and minimize the cost of production. Mr. Rajesh Tiwari, the director of the firm, has managed to lead us to commendable heights of success. His ability to predict market changes, implement changes and impeccable managerial skills, has been one of our greatest assets. In addition, special benefits and rewards are offered to the deserving employees, for providing them greater satisfaction. We provide our products globally. Manufacturing and Trading of Calcium Carbonate PPT / IP / BP / USP, Calcium Oxide USP, Calcium Hydroxide - BP / USP etc. To us, quality is something of high importance. Thus we indulge in using the finest ingredients and modern machines, as per the industry set norms and guidelines. Owing to this, the offered product has a longer shelf life and a commendable effectiveness. For the purpose of providing our clients the fines, we process these products through a number of quality examinations. The examination includes securitization of the products and elimination of any and every defect, by some of our highly skilled quality experts. 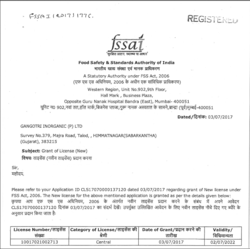 We are remarkably licensed by Food Safety and Standards Authority of India. 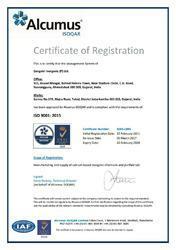 Our company is also certified by Royal Stancert Inc. for meeting and comply with the requirements of GMP( Guidelines for Good Manufacturing Practice. We have been approved for Manufacturing and Supply of Calcium based Inorganic Chemicals and Purified talc. 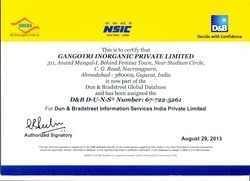 We have a highly futuristic state-of-the-art infrastructure at Gangotri Inorganic (P) Ltd., which is laced with all the machinery and amenities necessary for, maximizing our production capacity and Optimizing the standard of quality of the products we make available. Our infrastructure, upgraded on a regular basis, help us maintaining our pace in the race to be the market leader. In addition, for attainment finer and better management of firm’s functioning, the facility has been divided into a number of highly operational units. Our highly professional, skilled and dedicated team of professionals, work hard in a united manner to achieve a number of the firm’s goals and objectives. These professionals are recruited on the basis of their ability and willingness to work. In order to manage the team in the most efficient and skillful manner, we have divided them into a number of highly operational units. The division of these employees is done, on the basis of their proficiency in specific vocations. The units, in addition, work hard to boost the firm’s production capacity and maintain the standard of quality. We are amongst the leading manufacturer, supplier and exporter of a commendable range of Inorganic Chemicals. For the purpose of maintaining this market standing, we engage in utilization of the finest ingredients and modern machines, in accordance with the set industry norms and guidelines. Owing to the range’s effectiveness and shelf life is widely acclaimed. The offered range for reasons of standardization is sent for a number of quality examinations. Further, the product’s impeccable packaging, punctual delivery and market leading pricing, makes it highly praised and preferred.